I’m not sure if I was different than most kids… I loved coloring. I remember sitting in my closet for hours just coloring! I loved my Lite Bright, my Etch a Sketch, and of course my bedroom walls. As a teen I would draw my favorite band logos, album art, graffiti (public and all over my basement bedroom), my skin, my clothes. Just copying, and doodling mostly. Also, as a teen I became a mom, my art became being the best mama I could be 😊. Now that I am older, and on this “new journey”, I look back and I was always creating things. I did cross stitch, painted ceramics, scrapbooking, watching HGTV and trying crazy things around the house, some things that were super cool, other things not so much… like when I wanted my kitchen to be country and apple themed. I used red paint on my cupboards put crackle on that and then white on that. When the crackle started doing its thing… my kitchen looked like a crime scene😂. Blood splatter everywhere 🔪. I would wake up in the middle of the night and have an idea of how I could construct a covered screen porch over the existing deck. I would sketch out these plans like I knew what I was doing. Nobody ever taught me how to do anything, I would construct something in my mind, along with the materials I would need to make it happen. I did these things completely on my own, and to me.. that was just life. I didn’t have a significant other who was willing to help, if I wanted something done I just did it. Now.. I never did make the screened porch, which I still have it as a goal almost 20 years later, but for my current house! I have fumbled my way through building a flat deck, hanging ceiling fans (not replacing an existing fan, actually changing a ceiling light into a ceiling fan), putting in baseboards, crown molding, plumbing (which is a long sad story that I didn’t so much fumble through.. I ruined and created a huge job for someone else to fix… not my proudest moment 🙄). I guess I have always had this mindset that if someone else can do something, then there is no reason that I can’t. Then my life changed, something clicked inside me that pushed me from paper crafts and home projects into wanting to 🎨 create artworks. The universe is so funny, Artwork was not a foreign concept to me. I had been to galleries, my husband and I had an “art budget” when we went on vacations. But this gallery visit was different… I was inspired in a way I had never been before. I was on my honeymoon in 2015, and what better place for some grown people to go celebrate their union than… 🎺🎺 dat tadadaaaa DisneyWorld! 🤸🏼‍♂️⭐️✨👑🧚🏼‍♂️🧞‍♂️🧜🏼‍♀️. DisneyWorld has some awesome galleries with artwork that is more my style than most galleries I’ve been to. My eyes and my soul were in heaven! 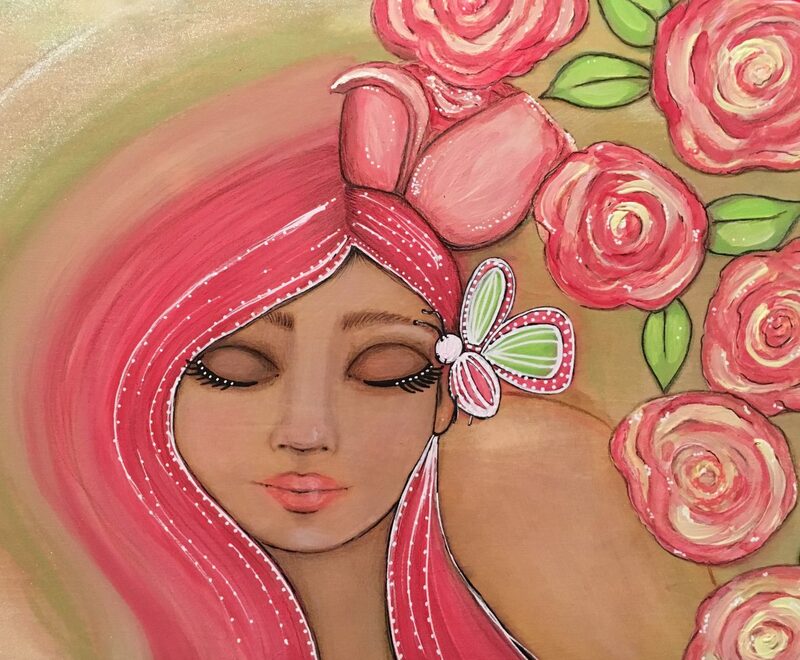 I discovered Fabio Napoleoni and Jasmine Becket-Griffith. Fabs (haha, I have no business calling him that but it’s just what I do lol) just happened to be attending for a live signing that day ⭐️⭐️⭐️. Needless to say I was unprepared…the line was a mile long, I had no art for him to sign, and it was nearly closing time. So, I did what anyone would do… I took a pamphlet, (which remains on my refrigerator to this day 😁) and learned about my favorite artist, not in a creepy, I want to wear your skin way… a genuine NEED to learn how he he did what he did, because in my eyes.. his artwork was perfection, and once again the ideas and plans were waking me up at night! So, I dove in! I started painting and I have to say my first paintings weren’t terrible. They are actually my most treasured, they tell a story that I didn’t even realize needed to be told. My need to have an escape plan, the memory of my sister, how I felt about being tied down to commitments. Those themes are portrayed, I never get tired of seeing them.. even with all their “mistakes”, things I did my own way, because I didn’t know how to do it the “right way”. Very early on I reached out to Fabs through Instagram.. *side note* this day and age is so amazing that you can reach out to anyone and the possibility exists that you will be responded to*… I sent him a picture of a finished painting of Alice in Wonderland, I’m pretty positive this was my first painting EVER. I asked if he would critique it, and he did, and he gave me advice, and he told me to keep at it 😊. It was so hard but I tried not to bother him too much..but I kept going, I fixed the things on my painting that he suggested and he was right of course 👌. I often wonder if he hadn’t responded, would I have kept going? Or was all of the timing orchestrated to get me on my life’s true path? I often say that I am a baby artist, but I think I have been an artist my whole life. The accumulation of all my 42 years of creativity have led me to this point. The overwhelming feeling that I have inside my soul that I am on the right path right now. Will my path change? I don’t know! I’m excited to see what is to come, and I am excited to read this origin story 5, 10, 20 years from now and be amazed at how the rest of my life unfolded. Seriously, don’t give up on your dreams, say them out-loud, let everyone who comes in contact with you know that you are destined for things bigger than you or they can imagine! Live each day doing what you love, share it with the world, and you will be able to say that you lived a fulfilled life.